If you’re into sneakers, you’re into sneakers. As more of an ankle boot and kitten heel kind of gal myself, the world of sneakers has always been a fascinating one to me. From the massive cult following that can build before a sneaker even drops to the intricate resale marketplaces that serve the most loyal sneakerheads, there is a lot to be learned about this industry, and I was ready to dive right in. In a recent meeting with GOAT, the world’s largest marketplace for buying and selling authentic sneakers, I learned that its female user base is growing at a rate twice as fast as its male user base. But this doesn’t just apply to who is shopping; it applies to what they are shopping. The female shoppers at GOAT are buying men’s sneakers at rapid rates, skipping over the women’s designs more often than not. “Most of the time I want to wear the same sneakers guys are wearing. The sneaker game is pretty gender-neutral, and size preferences automatically finds the best fit based on which brand I want,” says Diane Abapo, GOAT’s director of content. GOAT has a feature that allows you to shop according to your shoe size in both men’s and women’s styles, so that way you don’t have to waste time converting your women’s shoe size into men’s. The result? Making shopping from the boy’s section easier than ever. Curious to know more about which men’s sneakers women are buying? So was I. 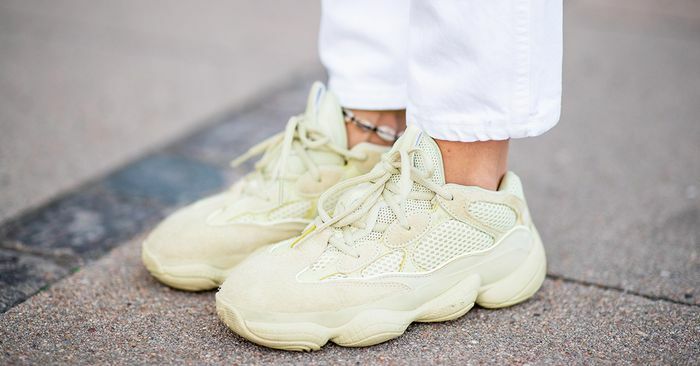 Ahead, Abapo goes on to share all of the information on the men’s sneakers women can’t stop buying from their site including the latest Yeezy’s, Air Max, and more.